I'm hesitant to say it, but spring has finally arrived here. Along with the warm weather and sunshine, I think we have finally finished with the time of year that my daughters seem to pick up a new cold every month. However, that thought always causes me to look around my house and think of all the places that germs and viruses might still be hiding, just waiting to reappear for yet another runny nose and congested cough. What I've realized is that the items that get washed and, for lack of a better word, decontaminated the most around here are, of course, the ones that are easily cleanable. Sure, it's not difficult to dump the bucket of plastic play food or dishes into the sink or throw the dress-up clothes in the washing machine, those are simple to do. However, as I look around, that still leaves... everything else. There are so many items throughout my house that get a lot of use but aren't able to be soaked or sprayed with chemicals (ick), so how do I get rid of the germs that are sitting there waiting to wreak havoc on our immune systems? The answer is not only safe but environmentally-friendly, chemical-free and completely odorless. 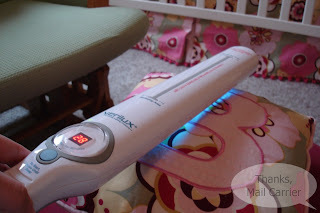 It is the CleanWave UV-C Sanitizing Wand from Verilux and it has been working wonders on the bacteria from the top of my house to the bottom. Using the same advanced UV-C light technology used to sanitize hospital equipment for more than 30 years, Verilux's products replicate the sun's ultraviolet rays in the palm of your hand. Using the same natural sanitizing properties, the powerful UV-C light in the CleanWave Sanitizing Wand eliminates up to 99.9% of viruses (including H1N1), bacteria, germs, mold, dust mites and flea eggs on the surfaces of your home. Sounds like an easy way to rid your house of these contaminants without using chemicals? It is. Having charged the CleanWave Sanitizing Wand with the provided adaptor the night before (rechargeable batteries! No wasted money!) I was pleasantly surprised at how light and easy this was to carry around. Even though it is close to two feet long, it only weighs 1.5 pounds and even comes with a convenient carrying strap at the end. It was no problem for me to hold Little Sister B in one arm and bring the CleanWave Sanitizing Wand with us up to her room. When we arrived, I looked around and found there weren't too many things that didn't need to be sanitized. Using the suggested length of time from Verilux, it was easy to push the power button, wait for the UV-C light to come on and get started gradually moving the Wand evenly along almost any surface. The digital display is extremely useful, as it counts up in intervals of 60 seconds and designates each minute so you know how long you have been sanitizing that area. Completely unobtrusive, I was able to clean multiple areas in Little Sister B's room while the girls happily played. How do I know it worked? Even though I wasn't able to directly see the results, the pillows, couch, rocking chair and footstool all smelled noticeably fresher. That clean, crisp scent that something has when it has been left out to dry in the sun? Yes, that's the one that I caught a whiff of when I put my face right up on the footstool that had previously smelled like... a resting place for feet. From surfaces like bedding and furniture to locations like the kitchen and bathroom, the CleanWave UV-C Sanitizing Wand can be used most anywhere and everywhere. I don't remember the last time many of my girls' stuffed animals or my keyboard, telephone or remote control were cleaned and, considering the amount that they are used, I don't even want to think of the microscopic things that were on them (eew) before Verilux came into our lives. The only concern at all with using this Wand is keeping the UV-C light away from skin and eyes, as it could cause damage with exposure. However, Verilux has done a great job safeguarding the CleanWave Sanitizing Wand from accidental contact because the wand automatically shuts off if it is tilted from a horizontal position. Even a slight twist of my wrist and the light disappeared, ensuring that I and my family wouldn't be harmed. One lucky person will win a Verilux CleanWave UV-C Sanitizing Wand of their own! ARV $69.95! To enter to win: Visit Verilux and tell me one of their other innovative items that you would like to try. 1 Extra Entry (per method) if you follow Verilux on Twitter, become a fan on Facebook, request a Verilux catalog and/or sign up for email updates to receive product previews and special discounts. 3 Extra Entries if you blog about this giveaway linking back to Thanks, Mail Carrier and Verilux. Please leave an address where it can be found. Giveaway will end on May 6th at 11:59pm CST. Do me the favor of leaving an email address or making absolutely sure it is visible in your profile, I have to have a way to contact the winner. The winner will be chosen by random.org and announced here as well as emailed and will have 48 hours to contact me or respond to notification or a new winner will be chosen. This giveaway is open to residents of the continental U.S. and Canada only. A huge thank you to Verilux for providing a CleanWave UV-C Sanitizing Wand for me to review as well as for one lucky giveaway winner. The opinions shared are my own and honest and if you really need to see more, click here to see how I roll. Very cool! I think I would like to try the sleep/wake light therapy (for my insomniac dad) and the light therapy for moi in wintertime. ClearWave Deluxe Phototherapy Skin Care System. I like the Original Deluxe Natural Spectrum Floor Lamp and Magnifier. I would also like to try the CleanWave UV-C Portable Toothbrush Sanitizer. HappyLight 4500 Sunshine Supplement Light System. That seems pretty cool!! I am a facebook fan of Verilux. Signed up for Verilux email updates. I entered the PlasmaCar giveaway. I would like to get Verilux's Shelburne Deluxe Natural Spectrum Executive Desk and Computer Lamp. I'd like to try their ClearWave Soothing Skin System. Entered the Justice Juels Handmade Jewelry with a cause giveaway. Wow...and I said I may not enter the giveaways. Hmmm. I have always wanted one of those toothbrush sanitizers. Not very expensive...don't know why I haven't yet! I follow you on GFC - and you are in my Google Reader! I'd like to try the Clearwave soothing skin system. I like the Cleanwave santizing sweeper. I would LOVE some of their light treatment stuff!! Ok, now this is Awesome!!! I would like to try the HappyLight Deluxe Sunshine Supplement Light System. I'd also like to try out the Shelburne Deluxe Natural Spectrum Desk Lamp. I would really like to try the UV-C light vacuum. It is so much less expensive than many other sanitizing brands I have seen! I would also like to try the Natural Spectrum Standard Base light bulbs. I've entered your Plasma Car giveaway. I've entered your Pillow Pet giveaway.